Running of the Bulls in Pamplona: Spain’s (in)famous San Fermin festival, referred to by many expats as just ‘Pamps’, brings together daredevils and spectators of the world for a week of bull dodging and serious, serious partying. What: The Running of the Bulls is only one part of the festivities for the town’s patron saint, San Fermin, including sports events, bullfights, fireworks, a giant-heads parade and a whole lot of wine and sangria. It is easily one of the wildest and craziest festivals in Europe and almost a rite of passage for Aussie travellers. 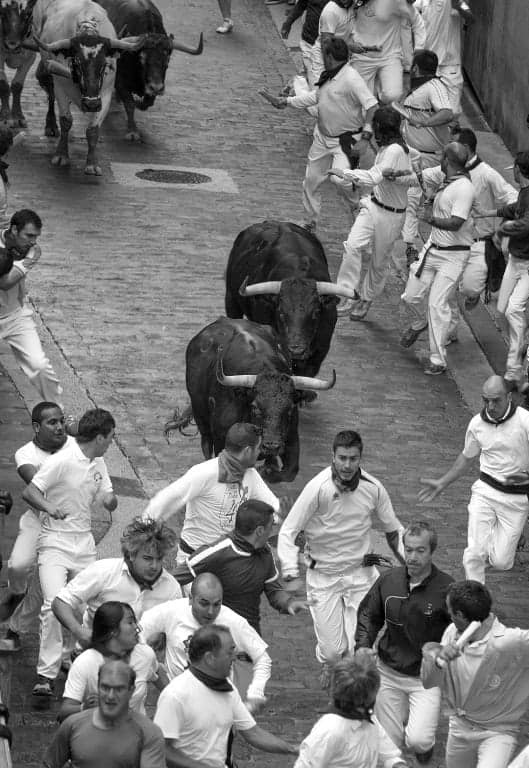 The daily ‘run with the bulls’ (encierro) is kind of like anti-bullfighting where men (and women, although this is frowned upon by the locals) run from rather than at the animal. The running of the bulls is the biggest of many events of its kind that take place in Pamplona and the surrounding region of Spain. There’s no great story for the origin of the loony pastime that is the Running of the Bulls, but it’s basically developed from the foolhardy games of bored cattle drovers. The San Fermin festival was brought to the attention of the wider world largely by writer Ernest Hemingway, who was quite taken with the event. Following his writings about the bull runs, young men have travelled from across the globe to prove their bravery on the streets of Pamplona, with the festival and its bovine dodging daredevils taking on ever greater proportions and notoriety. 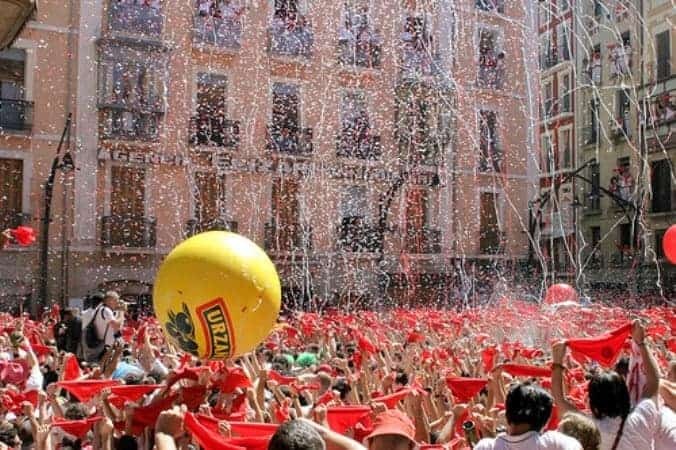 The kick off for the San Fermin festival in Pamplona is midday 6 July each year, when a rocket is fired to signal the end of sobriety and the start of unrelenting drinking and merriment. Not for the faint hearted, and that’s not just because of the bull running — there is some serious partying to be had. The opening day is often regarded as one the best days of the entire festival, with wine fights galore (don’t wear your good whites!) and a lot of friendly interaction between the tourists and the locals. For the bull runners, from 7 July onwards at 8am every day the bulls are released for their 848 metre sprint, which takes around four minutes to complete. It’s best to get ready for the run nice and early, with people usually gathering in the narrow cobbled stoned streets from around 6am. Another major part of the festival is the bullfight that happens every evening, and those who oppose the bloodthirsty charade want to make sure they’re up early each morning to see the bull’s get their own back on humans. The primary colours of the festival are white and red — with most runners/revelers wearing white t-shirts and white shorts/pants, with red hankies, scarves, belts and bandannas completing the San Fermin look. There is an airport in Pamplona but it is only accessible via domestic transfer. Other airports in the vicinity that are accessible from the UK are Bilbao – 170km away, Zaragoza – 172km away, and Biarritz (in France) which is 128km away. Pamplona is a decent sized city with a population of around 200,000 so there is plenty of accommodation but, naturally, you will have to plan way, way ahead to have any options for Pamps (over 350,000 visitors enjoy Pamplona over the festival period!). You probably are looking at 2019 now to get in on the action, but some of the popular youth travel companies like Top Deck and Contiki may still have some availability and are worth hitting up.